Among Metreta’s broadcast customers, co-founders Simone Bronzin, CEO, and Federica Gregori, COO, identified an unmet need for metadata. “Broadcast clients realise that their most important asset is video content but they know very little about that unless they watch it, only the technical and summary details,” explains the start-up’s pre-sales executive Maria Lodolo D’Oria. What Metaliquid aims to do is extract metadata from video content via AI-driven algorithms that are split into a number of recognition modules. These include setting recognition (indoors or outdoors, types of transport, landscape backdrops), language recognition (although not translation), facial recognition (the Metaliquid retains thousands of pubic figures in its database, which it is constantly adding to) and brand and object recognition (for sports sponsorship and product placement). The Metaliquid algorithms also claim to be able to distinguish between genres. These recognition tools can be deployed in a modular fashion to allow broadcasters to tailor the Metaliquid product to the needs of their viewers. According to Lodolo D’Oria, the application gives broadcasters the ability to provide new services for viewers, making the TV experience much more interactive. One Italian broadcast client, for example, is using Metaliquid’s credit detection function to cut out opening and end credits of content so that viewers can skip to the next episode, to encourage binge watching. 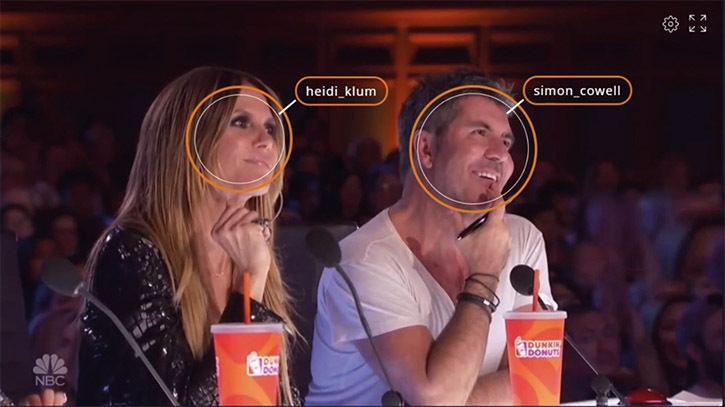 The same broadcaster is also using the facial recognition function in news so home viewers can identify public figures that appear in bulletins. The company charges on a pay-per-use model (by minutes processed) but offers an annual licence for heavy users. The solution can be accessed either in the cloud or on premises. “For us it’s easier to deliver via the cloud, but some of our customers don’t want to upload sensitive content,” Lodolo D’Oria adds. Companies that don’t want Google, Amazon or other open source frameworks involved in their content will also be pleased to learn that Metaliquid doesn’t use a third-party AI framework to do the machine learning – it has built its own, which Lodolo D’Oria argues is more suited to the needs of broadcasters. “Broadcasters are more interested in specific classifications of objects and environments that are customisable. Our framework delivers that as time-coded information that you can easily integrate into your systems,” Lodolo D’Oria says. The young team’s 13 employees (of which the average age is 32) hail from a range of disciplines that include physics, engineering, data science, AI and video analytics. Next year, the company plans to seek new funding to open up offices in the US and East Asia. It is also trialling a brand new live sports action recognition app with a broadcaster, which will extract and generate highlights automatically. Besides its scalability, it is this feature that will set the company apart from rival start-ups, according to Lodolo D’Oria, offering similar applications to those of Media Distillery or Valossa.